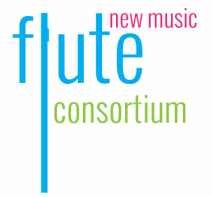 The Flute New Music Consortium is an organization with the shared mission of promoting new music for the flute by commissioning works, organizing simultaneous premieres, and encouraging repeat performances. Music enthusiasts and flutists of all ages and abilities are invited to join us in funding new works featuring the flute by becoming a member or making a donation to the project fund. FNMC strives to involve as many people as possible in each project. We encourage repeat performances and offer simultaneous premieres of commissioned works throughout the United States and the world. Our first commissioning project for solo flute featured Pulitzer Prize winning composer, Zhou Long. We look forward to our next commissioning project: a work for flute and piano by Carter Pann. Winner of the National Flute Association's Arts Venture Competition, FNMC was one of four finalists invited to present at the 2014 NFA Convention in Chicago. FNMC was also honored to receive a seed grant from the 2014 Illinois Music Entrepreneurship Competition. IMusE seeks to recognize entrepreneurial, creative endeavors that deliver musical activities in new and innovative ways. Additional honors include a grant award from the Oklahoma Arts Council (2015) and a grant finalist for New Music USA (2015). We welcome all flutists and music supporters to join us in promoting new works for the flute. Interested? Learn more about how you can participate.